If your first thought after seeing the recent hit IT was “Gee, I wish that evil clown savagely mutilated more people” then DAMIEN LEONE’s TERRIFIER may be right up your blood strewn alley. The killer clown in this movie truly isn’t playing around. In fact, I think I might have even been offended by a particular obscenity he orchestrated but luckily I don’t mind being offended too much. It’s kind of thrilling to take the less safe path with horror on occasion and to find yourself worrying that the film will push its violence across the border of your comfort zone. There are no subtle chills or elaborate backstories in TERRIFIER, this is a stripped down, back to the basics stalk and slash, heavy on the slash. Old school gorehounds willing to overlook the absence of good taste (or even much of a plot) for a down and dirty haunted attraction type crawl, chock full of sometimes alarmingly convincing practical make–up effects should be particularly satisfied. It doesn’t exactly break new ground but it certainly seethes with genuine menace. Sweetening the pot further, TERRIFIER takes place on Halloween night and even though it’s not able to muster the autumnal ambience of your average HALLOWEEN sequel, I’d still recommend it as premium party viewing for folks looking to celebrate OCT 31st. 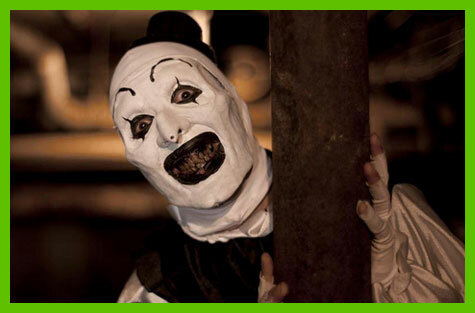 TERRIFIER’s formidable killer “Art” may look familiar to some as he has ravaged through LEONE’s earlier anthology ALL HALLOWS EVE (2013), both in a segment and the wrap around tale. LEONE not only wrote and directed TERRIFIER but also supplied the impressive make-up effects, which may explain why they are exhibited with such gruesome reverence and twisted glee. I have to say this clown is pretty darn nightmarish. His silent sneer and uncanny movements rather remind me of “the gentlemen” in the classic BUFFY episode “Hush” and I have to tip my tiny hat to DAVID HOWARD THORTON for his wickedly ghoulish performance, I also rather enjoyed the film’s lead JENNA KANELL (THE BYE BYE MAN) because she looks like STACEY NELKIN in HALLOWEEN III: SEASON OF THE WITCH but talks like MIRA SORVINO in ROMY AND MICHELE’S HIGH SCHOOL REUNION. She’s put through the wringer in this movie and she’s easy to root for but I should warn you that this isn’t the type of movie that cares about heroic redemption and untapped powers within. If it has any message it is that you should trust your instincts rather than your friends when you surmise the clown waving at you is a murderous maniac. If you live in Philadelphia, TERRIFIER will be playing on Thursday, September 28th at 9:30PM as part of PUFF (THE PHILADELPHIA UNNAMED FILM FESTIVAL) at the one and only Drake Building (more details HERE). Seeing this untamed horror movie with a screaming and squirming audience is sure to be an excellent way to kick off your Halloween season. I know you might be thinking that you’ve been killer clowned to death this year but in the words of one Dr. Loomis, “You don’t know what death is!” (P.S. I’m also hearing very strong word of mouth about TRAGEDY GIRLS, which is being described as MEAN GIRLS meets SCREAM and will be playing on Friday, September 29th at 7PM and will incorporate a prom theme party with shots for anyone over 21- and that means me – be there or be square!). Your post inspired me to finally watch All Hallow’s Eve, which has been on my ‘to-watch’ list for quite awhile. It was pretty fun but the Art the Clown segments were definitely the scariest. I’ll be interested in checking out his feature length debut. YIKES! This is on Netflix now.